This blog post was written a few months ago but my family and I recently experienced hurricane Matthew. We were forced to evacuate our home for four days. This was especially difficult for our younger son — who has significant language delays, transition difficulties, and severe anxiety. When we found out the eye of the hurricane was headed our way, our entire family panicked. We asked our children to choose their favorite few toys and our son’s meltdowns began. We put every visual we’d ever created into place and headed off. I’m hoping and praying you never experience an emergency situation but want your family to be prepared just in case……..
You never truly believe an emergency situation will happen to you. For some reason, you always think that it will happen to someone else. However, with the rise in severe weather and crime, it is important to be prepared for any kind of emergency situation. Here are five emergency situation scenarios, and the know-how you need to get through safely. Flooding often occurs quickly and unexpectedly. THE most important prep tip is creating a plan. When it comes to flooding, you will need to know when to evacuate. When authorities order evacuations, please follow their instructions. People cannot be replaced but your items can. If you have missed the chance where you can leave on your own, contact the fire department, and they will be able to assist with getting you out. Make sure to turn off your electric and gas, if you have time, or what is already a bad situation could become much worse. Also, make sure to move all of your important belongings to the upper floors or as high off the ground as you can get them. If you have no way of getting out, go to the highest point of your house, usually the roof, with a sheet or other high noticeable item, and signal to whoever you can for help. Tornadoes can come over of nowhere and become an emergency almost immediately. It is extremely important to get to shelter right away! Have an emergency action plan in place before you need it, and practice with your family. Store emergency items, such as non-perishable foods, bottled water, sturdy shoes, and warm clothing where you are planning to wait out the storm. The best places to stay are in a basement, storm shelter, or an interior room of your house covered with blankets or a mattress. Remember to practice calming and mindfulness techniques on a regular basis so that if an emergency arises, children have a ‘default’ to calmness vs. panic. If someone is trying to break into your house, immediately get everyone into the same room, while calling 911. Get as low to the ground and in as secure an area as possible. This could be a bedroom with a sturdy door and a lock or even a closet where you can cover up with things. Stay on the line with the police for as long as you possibly can and answer all questions that the operator asks. Only confront the person breaking in as a last resort. Snowstorms can be extremely dangerous. Many people don’t give it a lot of thought because it gets them time off of work. However, you can lose power, water lines can freeze, and even roofs can collapse. If a snowstorm has become an emergency, move everyone into one, small room and close interior doorways. If you have an open hallway, cover it with a blanket. The point is to have everyone in once space to retain heat. If you can, place something outside that can signal that you need help, such as a red flag or drawing a bright X on the door. Stay bundled up and only try to leave your home if it is absolutely your last resort. The very first thing to do when going camping or hiking is to be prepared. You should always pack enough food and water to get you through the trip, plus a little extra. Proper clothing and gear are also extremely important. Always let people know where you are going, what trails you are taking, and when you plan to return so that if you don’t return on time, people will look for you. Make sure you have a compass, so that is you become lost, you will know what direction you are going in. Also carry something you can use to signal for help, like a flair, air horn, or mirror. Also, it would be a good idea to carry a hiking GPS if you are able to afford it. 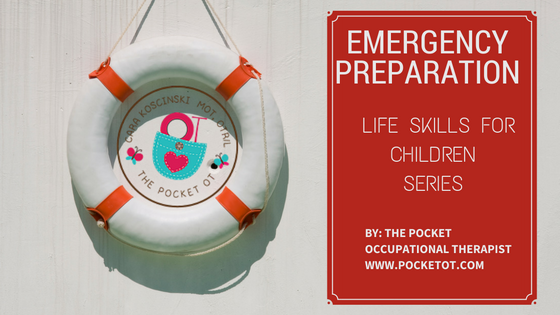 Any situation can become an emergency, and it is so important to know what to do. Some preparations can be easy, and other things you can’t plan for. The most important thing you can do in any emergency situation is to stay calm and not to act impulsively. Stay safe. PREPARATION is key! Review the plan monthly with your entire family. Create visual schedules and post them inside of a closet in the kitchen or coat closet so they are easily accessible.